Wiener Silber Manufactur’s history goes back more than 130 years. Founded in 1882, it became a partner to some of the main players in the Wiener Werkstaette (Viennese workshops). Today, it is the collaboration with internationally known contemporary artists and designers that determines the extraordinary and diverse product range of Wiener Silber Manufactur. Exclusive design, craftsmanship based on the methods of the traditional silversmiths’ art and very high-quality silver guarantee extraordinary objects for those who value true exclusivity. 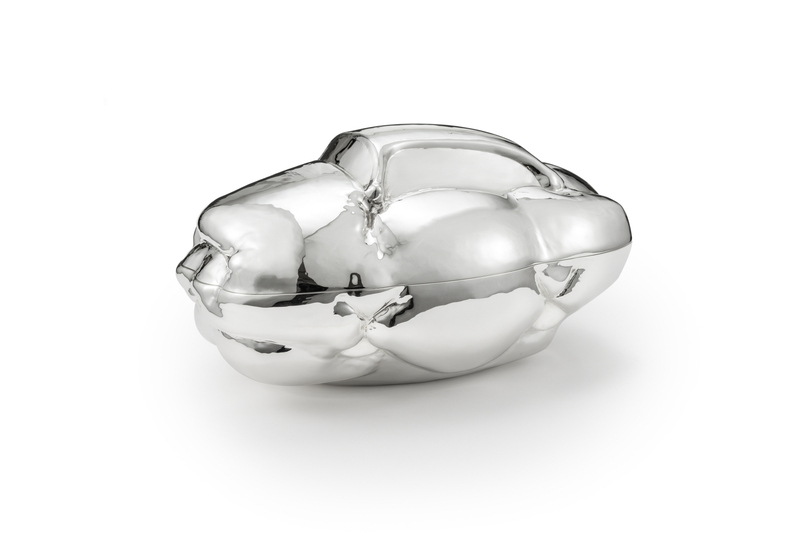 Erwin Wurm is bringing his famous “Fat Car” onto the table as the imposing ZUCCHERIERA sugar bowl. He sees it as a tongue-in-cheek reference to the famous Saliera china by Cellini. ZUCCHERIERA – an imposing, valuable and ambivalent holder – is hand-forged from pure silver. It is a work of art just as much as it is an object of utility. Every detail, every projection and every indentation has been hammered out by the silversmith from a single silver plate, in high-precision fine work involving thousands of hammer blows. It’s a production method which – in terms of the amount of work and expertise involved – comes very close to the method used to create the Saliera, and which is an expression of the highest achievement of the silver-smith’s art.